Many people struggle with with patellar tendonitis for months because they think – like I once did – that rest, ibuprofen, and doing a few stretches are enough to heal knee tendonitis. Following this standard treatment suggestion will actually make your knee worse. On this page, you’ll learn what to do instead. Do you want to get your life back and beat patellar tendonitis? 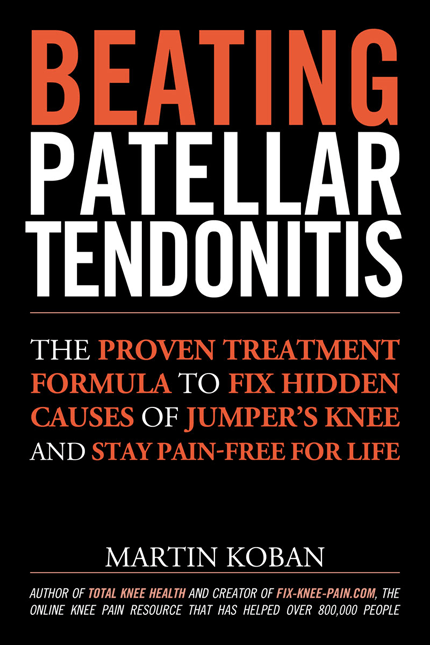 Update: I published a whole book about how you can get your life back and beat patellar tendonitis by fixing hidden causes of pain that most doctors ignore. You can download the first chapter for free to get started healing your knees today. Knee pain is an indication of some aspect of the body not working as it should and finding that underlying problem is the tricky part. By getting more familiar with the disease, we increase our odds of solving the tendonitis knee riddle. The following paragraphs will detail symptoms, causes, risks and conservative treatment options of patellar tendonitis. Picture: Where you’ feel the pain. The pain can occur in one or both knees. 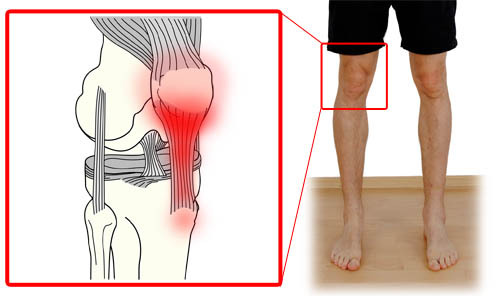 The symptoms for knee tendonitis are pain on the side of, in front of, below or even behind the kneecap. Most commonly the pain will reside below the knee cap, where the patellar tendon attaches to the patella. The pain usually gets worse with activities like squatting, running, climbing stairs and jumping. Additionally, you may feel tenderness below the kneecap and in the area of the bony protrusion right below. You should also know that patellar tendonitis progresses in stages and that each stage requires a different healing approach. To learn more about the symptoms of the individual stages, go here: patellar tendonitis symptoms. Jumper’s knee is an overuse injury and the result of repetitive microtrauma to patellar tendon. Usually such microtrauma is caused by activities that include a lot of jumping, running and cutting. Not surprisingly, sports such as basketball, volleyball and tennis have a high incidence rate of this injury, but it is not limited to these groups. A common theme among people who suffer from knee tendonitis is playing through pain or regular overexertion on the court. Pain, just like fatigue, causes movement patterns to deviate from the desired optimum and the worse you move, the more likely you are to suffer injuries such as patellar tendinopathy. But what happens if it is left untreated? Initially tendonitis will make itself felt as the pain accompanying the inflammation in the tendon below the kneecap, but with repeated tissue damage cellular degradation will set in. The body is unable to repair the damaged tissue and tendonitis turns into tendinosis: a painful chronic condition that will take months, if not years to heal, especially if the athlete lacks commitment to getting healthy before competing again. Ignore tendonitis and your pain will get worse, your condition will get more permanent and your weakened patellar tendon will be more prone to tearing. Do nothing and your athletic career might be over before it even started. Act early and you can be back to competition in a few weeks. Watch this video to learn more about how long recovery will take and how to avoid 3 dangerous mistakes that will add months to your recovery time, if you make them. Some athletes get relief by wearing an infra-patellar strap, which helps by improving load distribution in the tendon. There are several conservative treatment options for tendonitis. A common recommendation is the RICE-protocol (rest, ice, compression, elevation), combined with the use of NSAIDs (Nonsteroidal anti-inflammatory drugs). Other modalities used to deal with knee tendonitis include ultrasound treatment, deep friction massage, shockwave therapy and plasma-rich platelet injections. Speaking of injections: in his book “Framework for the Knee”, Nichalos DiNubile, MD, explicitly warns against cortisone shots, as they can “cause a rupture of the tendon” (page 20). In physical therapy, the rehab protocols for tendonitis revolve around strengthening and stretching of the leg muscles, with a focus on stretching the quadriceps muscle group. Keeping these traditional approaches in mind we can build on them to create a more holistic approach for knee tendonitis. This will help us to deal with jumper’s knee more thoroughly and also seems necessary, as the traditional methods of treatment apparently only provide temporary relief. There are a lot of simple things you can do at home to deal with patellar tendonitis and most of them don’t even require additional tools or help by others. The following list will get you started with your healing process and after that we will cover a number of exercises which will help you put the plan into operation. Healing Knee Tendonitis Step 1: Freeze right there! As most of you know, the inflammation in the tendon can be decreased through icing, which is mostly done after exercising. Using a wet towel between the ice and the knee is recommended, as this will prevent frostbite and improve temperature distribution. Apply the ice for a maximum of 20 minutes, directly post-exercise or several times throughout the day. You can also apply ice after performing rehab exercises, to minimize pain and inflammation. However, icing only helps with pain management and will not speed the healing process if you have already progressed from tendonitis to tendinosis (i.e. you have knee pain not just post-exercise, but also throughout the day and the condition did not improve after two weeks of rest). If this is the case you can experiment with using a warm water bottle or a heating blanket for 20 minutes, several times a day. With the warm water bottle you again have to use a wet towel to prevent burning and improve heat distribution. When using heating blanket you should wrap it around your knee and then wrap a big towel or a blanket around it, to keep the heat in. I have successfully used heat with my patellar tendon pain and I felt like it definitely sped up the healing process, which is only logical as the increased temperature improves circulation. On the other hand, being outside in the cold winter weather increased knee pain noticeably. Your mileage may vary, so just experiment to find out what works best for you. In conclusion one could say that while ice is the way to deal with inflammation you feel after exercising (be this rehab or performing in your sport), it actually slows healing once you’re dealing with tissue degradation instead of inflammation. Tendonitis pain should go away after a week or two of rest, but if the knee pain persists you’re more likely dealing with tendinosis. Only you and your physician know where you stand. Driving a car with your feet on the gas and the brake at the same time will ensure lower performance and early malfunctions. This is what’s going on in our bodies most of the time when we suffer from ailments such as knee pain, as bad biomechanics prevent us from achieving our athletic goals and predispose us to injury. Anterior Pelvic Tilt (forward tilted hip) is one of the conditions which can lead to patellar tendonitis, as Dr. Perry Nickelston points out in his article on “Lower Crossed Syndrome and Knee Pain”. Check where you stand in terms of posture and immediately address every problem you uncover. You can use this article on anterior pelvic tilt as a starting point. The exercises at the end of this page will also help you improve your posture. I’ve only devoted three paragraphs of this article on improving posture, but believe me: it’s of utmost importance. As explained earlier, jumper’s knee occurs when the patellar tendon is overloaded. Dr. Kelly Starrett of San Francisco Crossfit points out that this can actually occur as a result of tight calves and hamstrings, which is all the more obvious when looking at the muscles around the knee. Hamstrings and gastrocnemius are both responsible for knee flexion and if either of these structures is tight, the quadriceps has to work against additional resistance when extending the knee (research supports this). This will obviously put additional load on the patellar tendon. Before stretching, tissue quality has to be addressed first. You can have this done by professionals, using active release massage technique for example, or you can do it at home using a foam-roller. In my free email course I’ll show you a special technique that brought me great results without having to buy any tools. Once you’ve improve tissue quality you can get started with the stretching. Remember: with stretching you’re not lengthening the tissues; you’re actually reprogramming your nervous system to allow for more muscle extensibility. You will be a lot more effective at retraining your central nervous system if you stretch daily or even several times a day. The stretching will help take load off the patellar tendon and will have an immediate impact on your knee discomfort. The exercises further down will give you detailed instructions on how to improve tissue quality and length. We need a certain degree of mobility and stability at every joint. Some joints need more stability and some need more mobility. Both, the hip and the ankle, need to be mobile and if they lack mobility the body will make up for it by increasing mobility at the neighboring joints (i.e. knee and lower back), which should not be too mobile. This can translate to knee ailments such as knee pain, lower back pain and a host of other problems that are beyond the scope of this text. Decreasing tendonitis knee issues will require more than just diligent stretching though, because a lack of mobility can actually be caused by low stability (i.e. you cannot move safely through certain ranges of motion and your central nervous system knows that, which is why it will stop you from entering those ranges). By tensing up, the central nervous system uses your muscles to protect the body against injury. Hence, a lack of mobility can sometimes be attributed to the CNS not knowing how to use the muscles properly and it uses tension to keep you from performing movements that it deems dangerous, like touching your toes or doing a full split. In the section on jumper’s knee exercises we will go through several drills that can be done daily and will help you improve mobility and stability by retraining your central nervous system to allow proper movement. Assume a stance with your feet directly under your hip and parallel. Now squat down by sitting back as far as you can, rather than dipping straight down. Pay attention to how your knees move: does one knee cave in? Do both knees cave in? Do you have trouble maintaining your balance in the bottom position, meaning, do you keep falling over backwards? If you answered yes to any of these questions you have one or more imbalances, which you need to fix before venturing into the field of athletics. If you don’t, you risk getting tendonitis knee pain or worse, a torn ACL or meniscus. Here is how an imbalance like that can lead to knee pain: if your knee collapses inward during running or when landing, you will put excessive stress on the patellar tendon and thereby increase your risk of getting knee tendonitis (and slowly shred your ACL). The only way to retrain your central nervous system is by moving the right way and since you need to overwrite wrong programming, you’re going to have to do it very often. We will get to that in the exercise section. The gluteal muscle group is very important for knee health. Strong and functional gluteal muscles will not only help you produce force more efficiently, providing a more forceful hip extension which allows you to jump higher or sprint faster, they also resist movement in the opposite direction. This is important for preventing knee tendonitis, because healthy glutes will prevent the knees from collapsing inward when landing from a jump. On top of that, poor gluteal function can lead to overworked hamstrings, which in turn leads to a tighter muscle, requiring more tension in the knee extensors, thereby putting the patellar tendon under higher load. Poor gluteal function will also put you more at risk of pulling or even tearing your hamstrings, as these muscles are chronically overworked. Finally, among many other problems, weak or non-functional gluteals can cause lower back pain. With all that in mind it’s safe to say that gluteal training should be included in the training regimen of every athlete and it should be emphasized for those suffering from jumper’s knee. Pro tip: train your glutes throughout the day when climbing stairs. Shift the load from your quads to your glutes and try to squeeze your glutes hard with every step. This will help strengthen the neural connection to your glutes. Research indicates that eccentric exercises can be very beneficial for speeding up the healing process of damaged tendons. To apply this method to knee tendonitis we simply have to squat with an emphasis on the lowering part of the lift. Lower yourself down slowly (i.e. taking 4 to 5 seconds) and get back up assisting yourself, for example by grabbing a hold of a sturdy piece of furniture, a doorway or the hand of your training partner. The efficiency of eccentric squats can be improved further by performing them on a slanted board of around 25 degrees, as this puts more load on the patellar tendon than if you were to do squats on even ground. All this can be compressed in one simple, albeit hard to follow, piece of advice: take it slow! If you train too hard, too often, you’re going to get injured. The irony of that is that most people train hard with the intention of progressing quickly, but they eventually get injured, which stalls or even regresses their training progress. Don’t be that guy (or gal). Once you’ve crossed the Rubicon and have gotten injured you will need to take it slow with getting back to training, or else you risk delaying recovery indefinitely. The following exercises address the issues we covered in the 8-step action plan. Once you know all the exercises you can start the recovery program for tendonitis knee pain. You don’t need a gym membership to perform these drills, as a matter of fact, you only need to get two tools: a foam-roller and an elastic band (I use Therabands). I suggest you get one of the stronger rubber bands, but not necessarily the strongest one there is. Additionally you will need a blanket and a stick, such as the stick of a broom for example. Unless stated otherwise, all exercises are to be performed barefoot. This will help strengthen your ankles and will enable you to derive maximum benefits from the exercises. The only acceptable reasons for wearing shoes are the need to wear orthotics and having to train in public places with a high risk of infection (e.g. the gym). Wear minimalist shoe wear in that case. For more information on that: benefits of minimalist shoe wear. A few words of caution before we get started: foam rolling should not be used on body parts that you have recently suffered an injury to. You should consult your physician about foam rolling if you have circulatory problems or chronic pain conditions such as fibromyalgia. Please also take note that while foam rolling is a cheap and easy way to improve tissue quality, results will not appear overnight. You will have to work on your fascia daily for a week or more in order to notice improvement. 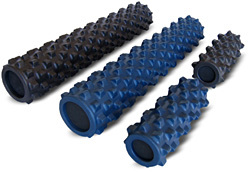 With foam rolling you’re targeting your soft-tissue (i.e. you should not be rolling your joints or other bony structures). Adjust the pressure you create with the roller to not cause pain, but don’t use too little pressure either. Just imagine you’re getting a massage: you wouldn’t want the therapist to leave bruises, yet at the same time you don’t want them to be too gentle either. In time, tissue quality will increase and you can spend less time foam rolling, but in the beginning you might have to spend between 1 to 2 minutes per muscle to achieve results. Don’t roll a muscle longer than that, as it can actually have a negative impact on tissue quality. If you want to do more, just do several sessions per day. Once you’ve done this for a couple of weeks you will know when you’ve reached the point of diminishing returns. Releasing trigger points in the quadriceps muscle group is an important part of our exercises because it will increase the efficiency of the quadriceps stretches we’ll do later. A muscle with trigger points or other soft-tissue problems will resist stretching, making the process not only more time-consuming but also more painful. Get in a plank position and place the roller under your thighs. Roll back and forth moving your thighs across the roller by pushing and pulling with your arms (make sure to not shrug your shoulders towards your ears). Keep your knees straight for a few repetitions and then experiment with bending your knees, turning your feet out and combining both variations. This will enable you to hit certain spots you might have missed before. You can increase the intensity by just rolling one leg. Once you have rolled out the tension in your rectus femoris, simply turn your body to one side to proceed with the next patellar tendonitis exercise. The Vastus Lateralis is on the outside of your leg and can sometimes become attached to the iliotibial band, thereby restricting free gliding of the fascia. This way a tight Vastus Lateralis can contribute to lateral knee pain. You can hit the Vastus Lateralis better by rolling a bit more on the front of your thigh, as opposed to just on the side. As with the other drills you can increase or decrease pressure by placing more weight on the supporting limbs. Like in the previous drill, try bending the knee of the leg you’re working to hit some unnoticed trigger points. Once your vastus lateralis is all nice and soft, just continue turning to the side and proceed to the next drill. The iliotibial band runs down the outer side of your thigh and rolling it might be a bit uncomfortable the first couple of times. Reduce the pressure by putting more weight on your supporting limbs if it’s too painful for you. To foam roll the iliotibial band, just place the roller on the outside of your thigh and then roll back and forth until you feel the pressure “melting”. Remember to relax. Don’t react to trigger points by tensing up your muscles and that also applies to facial expressions: keep a relaxed face. After a couple of sessions you can increase the pressure by putting more weight on the working leg. Once more thing: sometimes space is limited and if that’s the case rolling in short strokes might be more feasible than doing the entire ITB in one long stroke, especially if you’re a tall person like I am. Once you’re done with your ITB you just move the roller up to the side of your hip for the next exercise. The area we’re targeting with this drill is on the side of your hip, slightly to the front. 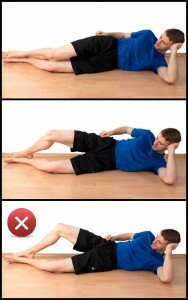 Lie down on your side, with the roller under your hip, slightly to the front. Avoid all bony prominences in that region and just concentrate on the soft tissue. You can change the intensity by putting more weight on your supporting limbs. Gently roll back and forth for a few minutes until there’s no tension left. As with the other drills: go slowly. Once you’re done with the TFL turn sideways to prepare for the next exercise. To hit the Gluteus Maximus you sit down on the roller, balance with your hands behind your back and just roll back and forth like in the previous drills. You can increase the pressure by just rolling one side. Some coaches recommend using a tennis ball or lacrosse ball, but I found those small implements to be too inconvenient. I spent more time fiddling with the setup than I spent actually rolling. You might want to give it a shot though, as tennis and lacrosse balls are cheap and can also be used for other muscle groups like the chest. From this position you can easily move to the next area by moving your body backwards and letting the roller move to the back of your thighs. By the way: in some cases rolling your Gluteus Maximus can alleviate back pain, as too much stiffness in the GM can cause flexion in your lower back. Rolling on the back of the thigh you can hit your hamstring muscle group. I prefer to roll each leg individually, as this makes it easier to roll all muscles. On the inside of the back of your thigh you can hit the semimembranosus and semitendinosus. The biceps femoris is on the outside of the back your thigh. Make sure to be thorough, as soft tissue problems in this region can directly contribute to hamstring “tightness”, which will place more stress on your patellar tendon, as your knee extensors have to work harder (i.e. against the additional resistance of the “tight” hamstring). Push the roller down to your calves and journey on. Foam rolling the lower leg is very similar to rolling the thigh. Roll your calves keeping your knees straight to hit the Gastrocnemius and then roll your calves with your knees slightly bent (not pictured) to hit your Soleus. You can also tilt your body to the side to hit the muscles on the side of the lower leg (e.g. Peroneals) and on the front (e.g. Tibialis Anterior). Be careful not to use too much pressure though, as these are very small muscles. If you have a tennis ball or a lacrosse ball you can use it here. Just place the ball under your foot (without shoes on obviously) and roll the bottom of the foot (Planter Fascia). This can magically free up additional range of motion in the rest of the body, as the fascia of the whole body is interconnected. 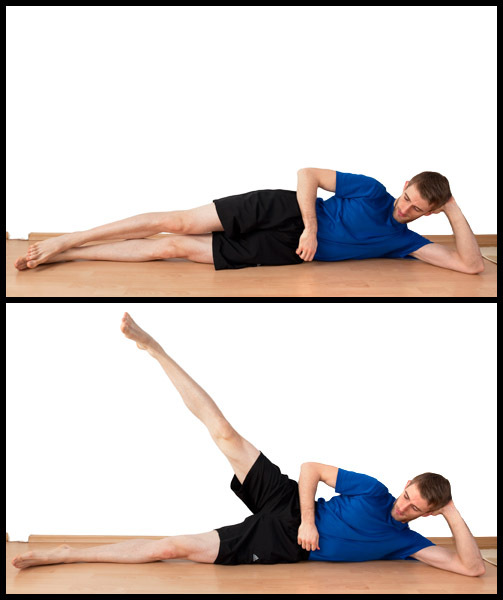 Patellar tendonitis exercises wouldn’t be complete without a good stretching regimen. We’re going to stretch the quadriceps muscles, the TFL, the calves and the hip flexors. As I’ve mentioned before, tightness in the hamstrings can contribute to tendonitis knee pain, as the knee extensors have to work against additional resistance, which will put extra load on the patellar tendon. In most cases it is not a good idea to stretch the hamstrings though, as the tightness you feel is just your body’s reaction to that muscle being overworked. The typical postural misalignment of today is anterior pelvic tilt (pelvis tilted forward), because we sit a lot, which leads to a neurological shortening of the hip flexors (e.g. rectus femoris, iliopsoas). Once we stand up, those short hip flexors pull the top of our hip and our lower back closer to our thighs, creating an excessive curvature of the lower back. This will lengthen the gluteals, because they are the antagonists of our hip flexors and normally create hip extension. The gluteals will slowly lose function and the hamstrings now have to pick up the slack to create hip extension which will lead to overworked and tight hamstrings. This is why I suggest you stretch your hip flexors and strengthen your glutes: it will remove factors that are very likely to contribute to hamstring tightness and thereby allow your hamstrings to get back to normal. It is very likely that you are in a similar situation, in which case simply aggressively stretching your hamstrings will not work to remove the tightness permanently. That being said, let’s finally move on to the stretches. The hip flexor stretch is tricky and easy to do wrong. Set up in a lunge position with your bottom knee padded using a blanket, towel, yoga mat or something similar. Keep your back straight and vertical. Looking at the anatomy of the human body you can see that some hip flexors attach to the hip and the Psoas Major even attaches to the lower back. Now, if you want to stretch the hip flexors you have to lengthen the muscle, which creates forces that try to tilt your hip forward and increase the curvature in your lower back. You have to resist these forces by bracing your core and strongly tensing your glutes. In order to stretch your hip flexors you have to brace your abs (as if bracing for a punch) and tense your glutes. Depending on the surface you work on you now either have to sink forward and down, having your upper knee travel forward or you can get everything tight and push the rear leg backwards by tensing the glutes. Tensing the glutes will not only increase your ability to engage them actively, but it will also help stretch the hip flexors through a process called reciprocal inhibition: if you use a certain muscle, its antagonist relaxes. To make change, perform this stretch for at least two minutes per side. I usually start with my tighter hip flexor and stretch both sides twice for a total duration of 4 minutes. You can also make this stretch more dynamic by moving your hip forward and back, thereby increasing and decreasing the stretch with the movement. Just make sure not to slip into the compensational patterns. Once you’re familiar with this stretch you can combine it with a simple ankle mobility drill. Place a stick just on the outside of your toes and as you sink into the stretch you move your knee beyond the stick on the outside. This will prevent your arch from collapsing and will improve your ankle mobility. Don’t force the range of motion, but only go as far as you can without straining. With mobility drills you won’t feel a stretch and the exercise is more about working the available range of motion of the joint to slowly restore its complete ROM. The setup for the quadriceps stretch is similar to the hip flexor stretch, but here you grab your leg with the arm of the same side. Make sure to have ample padding under your knee for this one. Personally, I prefer getting into position for this stretch by lunging down to have my knee on the pad, after which I will lean forward at the hip and grab my ankle (don’t grab the foot). After that I will get my torso upright again, holding on to the ankle and get into a good position for the stretch. Getting into position this way made it easier for me to find a more comfortable position for my bottom knee. At this point you need to pay attention to the same things as with the hip flexor stretch: keep your back straight and vertical, don’t let your hip tilt forward and don’t lean forward. To move into the stretch you can pull your leg closer, tense the glutes and let your hip move forward (not tilt forward!) and sink down. In a nice variation of this exercise (easier on the arms) you prop your rear leg against a wall. To perform this drill, set up with your side towards a wall, bend the leg that is away from the wall and place it forward, while keeping the other leg straight. The forward leg will help you support your weight and maintain balance. In the beginning this setup will be a bit tricky and it takes time to find a “comfortable” way to do this. Once you’re in position for this stretch, sink down, keeping your torso upright or slightly bent away from the wall. You should feel the stretch on the outside of your hip. Increase the intensity by leaning away from the wall. Remember to always keep the bottom leg straight. It helps to have a surface that prevents the foot of the working leg from slipping away from the wall, but you can also have a training partner block your foot from slipping away. There are several ways to stretch your calves, but I found this one to work best for me. You will need something sturdy to stand on and shoes with a solid sole. Step on the object, placing the balls of your feet on the ledge. Now sink down into the stretch, keeping your knees straight. You can intensify the stretch by putting more weight on one leg. A word of advice: don’t let your arches collapse and keep your knees aligned over your feet. Your ankles shouldn’t rotate inwards at all. If you feel pain in your ankle you will need to find another position to perform this stretch (e.g. standing on a curb and leaning forward). Once you’ve stretched your calves with your knees straight, you can bend your knees. This will shift the focus to different muscles in your calves (from the Gastrocnemius to the Soleus). With the strengthening exercises we’re going to improve strength and function of your gluteal muscles, improve your mobility at the ankle and the hip and we will also speed the healing process up by directly strengthening your patellar tendon. To derive maximum benefit from these exercises you have to pay attention to proper postural alignment of all body parts. With regard to your feet and knees: keep your feet either pointing forward or pointing in the same direction as your thigh. Your thighs will only point outward when working in a very wide stance and therefore your feet should also only point outward when working in a very wide stance. Lie down on your back and bend the knees to create a 90 degree angle, while your hip is still on the ground. With both feet planted, push through the heels squeezing your glutes to form a straight line from your chest to your knees. This is the regular glute bridge. In the advanced version you keep one leg straight and push yourself up using only one leg. Just like in the two-legged version you squeeze your glutes and lift your body up. In both versions you have to hold the elevated position for around 5 seconds, squeezing your glutes hard during that time. Touch the gluteal muscles with your hands to help your nervous system rediscover the neural pathways to the muscles, should you have trouble getting them to fire. The main workload has to be felt in the gluteals and not in the lower back, hamstrings or abs. Only move on to the one-legged version once you feel your glutes working hard and you can keep good form throughout the set. Put the stick on the middle of your back and have it touch your head, your back between your shoulder blades and your tailbone. Maintain these points of contact during the movement and don’t tilt your body to the side, or else the stick will roll off. The distance between your lower back and the stick should not increase too much. You can have a partner cue you through the movement or use a video recording (e.g. your cellphone). If these options are not viable, you can put your hand in the space between your lower back and use the stick to gauge the distance. In the advanced variation of this exercise you will also raise your opposite arm toward the front. With the side-lying clams we train another movement pattern at the gluteal muscles. This is a very subtle movement in the beginning, as the neural pathways to the required muscle have been dormant in most of us. Pay attention to performing the exercise the right way. Lie on your side with your body straight. Now bend both knees a bit. Rotate the upper leg out without tilting your hip back to perform one repetition. I prefer to hold the upper position for 2 or 3 seconds, as this helps me feel the correct muscles working. As the name suggests your legs should imitate the opening motion of a clam. Keep your upper body in place throughout and don’t roll on your back (3rd frame) to increase the range of motion. This will trick you into using the wrong muscles for the job. This is the third exercise we use to retrain the gluteal muscle. Lie on your side with your body forming a straight line. Then raise the upper leg upward, just moving from your hip. As in the previous drill, your upper body remains in place and does not contribute to the movement. Only go as far as you can without compromising technique and hold the top position for two to three seconds. Keep your feet parallel to each other or lead with the heel of the working leg. This exercise is specifically designed to teach you to resist movement at the hip. Take your rubber band and hold it out in front of you. Now step onto the band with your feet hip-width apart. Put the bands into the opposite hands and you’re in the starting position. From the starting position you squat down slightly by sitting back and now you walk sideways, moving one leg at a time. Don’t let the “rear” leg drag on the ground, but pick it up and resist the tension of the band. You can make this exercise (a lot) harder by using a stronger band or pulling on the band more. Just like in the other strengthening drills: move without using momentum. You should be able to stop at any point and then reverse the movement into the opposite direction. I suggest you perform this exercise with a stick as a guide for the first couple of times. This way you can find your ideal head and back alignment a lot easier. Have the stick touch the back of your head, your upper back between your shoulder blades and your hip at all time. I also highly recommend performing this drill with the big toe of the other foot on the ground (as shown in the picture). This helps grooving the proper movement in the beginning, as the body would quickly resort to unwanted compensational patterns if it felt too threatened or overwhelmed. 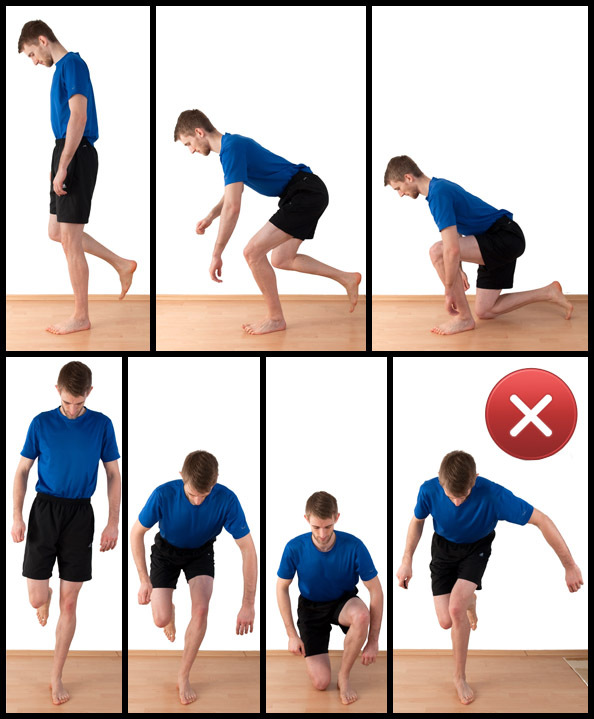 For our purposes, the error you need to avoid is having your knee collapse inward (last frame). This is the at-risk position for injuries to the knee from simple patellar tendonitis to ACL-tears. Strengthen the correct movement pattern and your risk of injury will drop significantly. 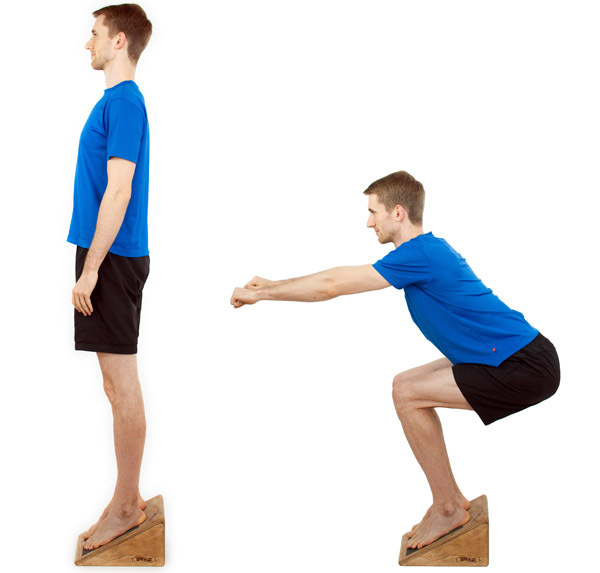 To perform this exercise you assume a stance with your feet hip-width apart and pointing forward. Move one leg back and bend it, so that only the big toe touches the floor. The majority of the weight will now be on the working leg. Start the movement by sitting back and once your knee is bent a little, you bend forward at the hip. Keep your shins vertical and your back straight (i.e. touching the stick at the supporting points). Go as low as you can without compromising technique. To return to the starting position, squeeze your glutes hard and reverse the movement. Keep squeezing your glutes until you’ve locked out in the top position again. You can experiment with different degrees of knee bend. The less you bend your knees, the more hamstring flexibility the exercise will require. You can progress to more demanding variations of this exercise once you’ve mastered the easier versions. To make the exercise more difficult you take the supporting foot off the ground. This step should be open to you after the first week of training. Be sure not to have your knees collapse inward und continue to use the stick if you need to. You can also gradually improve the range of motion, although this happens automatically in my experience. The next step in loading would be holding a weight on the hand opposite to the working leg. Use a light weight to be able to maintain flawless technique. Once you feel confident you can of course use heavier weights and later you can even hold weights in both hands. The benefit of this exercise goes way beyond knee health, as the improved proprioception and strengthening of the ankle will also bullet-proof your ankle. In spite of landing on other people’s feet after rebounding I haven’t sprained my ankle even once after implementing this exercise into my training. The King Deadlift is a very difficult single-leg exercise that will require a lot of strength and a good deal of balancing skills. This is a strength drill, so perform it in a controlled fashion without any bouncing or momentum. You have to be able to freeze at every point during the movement. To perform the King Deadlift you stand on one leg and start sitting back while keeping the other leg bent. The knee of the other leg should be the first thing to touch the floor (use padding in the beginning! ), but of course it’s ok to assist yourself with your other leg a little bit at first. To get up from the bottom position you must not use momentum. If you don’t have the strength to get up just using one leg you can assist yourself with your back leg. Always remember to never sacrifice poundage lifted for technique, because in the end that mentality will not only get you injured, but also prevent you from setting records. When doing the King Deadlift you also have to pay utmost attention to the position of your knees. Don’t let your knees collapse and don’t let it travel forward too far. The knee should stay behind the toes of the foot. Eccentric squats on a decline surface have been shown to speed the recovery of patellar tendonitis and they should therefore be included in our training. You can improvise a slanted board using wood and some books, but you could also go to a hill. As a last resort you could wear shoes with a sturdy sole and stand with your heels on the curb. The shoes shouldn’t restrict your ankle though. Be creative. To perform the eccentric squats you assume a squatting stance on the board and squat using just the strength of your legs on the way down. Support your weight in some way on the way up. I used the stick to push off from the ground. Many people perform squats in a way that is more stressful on the knees and doesn’t recruit the gluteal muscles a lot. To perform it the right way, imagine sitting back on a chair that is far away, rather than dipping straight down. Start and lead the movement with the hip. Only start bending at the knee once it’s necessary to go lower, but keep your shins close to vertical throughout (will happen automatically if you sit back as far as you can and only move from the hips). Don’t let your knees collapse inward. To reverse the movement, you push your hips back as far as you can. You should feel your gluteal muscles working as you get up. Oh and don’t let your knees collapse inward. Depending on your strength and pain level, you have to determine how low you want to squat. In the beginning you can just squat to slightly above parallel (second frame) and once you feel confident you can perform the full range of motion. The question of how deep you should squat is controversial to say the least and could fill another 25 page article, but I will trim it down to one paragraph. Without a heavy barbell putting additional load on your back it’s totally safe to squat all the way down. Children do it all the time. Billions of people in other cultures spend a significant amount of time in a full squat and you know what? Their incidence rate of hip and knee pain is a lot lower. On top of that the cartilage in the knee only gets supplied with nutrients if the knee is moved through the complete range of motion. If you only ever squat to parallel your cartilage will not get enough nutrients to stay healthy. This is a very advanced drill that should only be performed if the two-legged version can be done pain-free through the complete range of motion for at least 50 consecutive reps. You also have to be proficient in the one-legged deadlift and king deadlift before trying this. Steve Maxwell has written an excellent piece on the full ROM single-leg squat (aka pistol) and I suggest you read it before tackling this skill: how to become a pistolero. Since this is a very advanced variation you don’t need to read it now, as there will still be plenty of time in the coming weeks while you work on the foundational movements. To perform the single-leg eccentric squat you lower yourself on one leg sitting back as far as possible (just like in the regular squat). Use the second leg on the way up. If you need to hold on to something for balance you can use a training partner, doorway or a sturdy piece of furniture. Depending on how you are built you might have to use a light weight between 5 to 10 pounds for balance (hold it out in front of you). Hang on to a doorway or a sturdy piece of furniture if you have to. Range of motion in this drill is even more controversially discussed than ROM of the two-legged squat. I’ve been doing pistols for years now and the only time I ever felt it in my knees was when I increased my volume injudiciously (as in from 3×6 to 5×9). Now, we know from the graph in “Step 8: take it slow” that there will be tissue breakdown before pain sets in, so we have to give our bodies enough time to recover and only increase volume (number of reps), frequency (how often you train it) and intensity (how low you go) judiciously. That being said, if you slowly increase one training variable (volume, frequency or intensity) in a given training cycle of 6 to 8 weeks you will derive great benefits from a properly performed pistol. If you do too much too soon with improper technique, you will get hurt. Now that you are familiar with the exercises we can put them in a program for tendonitis knee pain. The program is divided into phases and it’s up to you to decide when to go to the next step. The number of repetitions given for single-leg drills has to be performed with each leg. On the surface this phase may seem boring and useless, but trust me, performing these seemingly simple drills can teach you a lot. Those are the basics that everyone has to master and any athlete that has a flawed foundation will never reach his or her full potential. Stay in this phase for at least 1 to 2 weeks. In the second week you go through the strength training circuit twice (so four times a day). Perform the foam rolling at least 4 times per week. Do the stretches at least 5 times per week (perform the hip flexor stretch with the stick to work ankle mobility). Practice the unassisted one-legged Deadlift drill two or three times per day. Only do a couple of repetitions per set and then rest before starting the next set. Pay utmost attention to picture perfect form and never exhaust yourself. Perform the foam rolling 3 times per week. Do the stretches at least 4 times per week (perform the hip flexor stretch with the stick to work ankle mobility). Three times a week: perform the one-legged deadlift. Start with 2 sets of 8 reps and add repetitions once you feel proficient and strong enough. Technique should be as close to perfect as you can manage. Stay in this phase for at least 2 to 3 weeks. Perform the foam rolling at least 3 times per week. 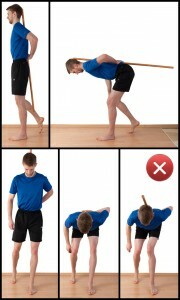 Do the stretches at least 3 times per week (perform the hip flexor stretch with the stick to work ankle mobility). Practice the King Deadlift two or three times per day. Only do a couple of repetitions per set and then rest before starting the next set. Pay utmost attention to picture perfect form and never fatigue yourself. Once per day, perform one-legged eccentric squats to just above parallel on the slanted board (use both legs to stand up), 2 sets of 5 – 7 reps (rest as much as needed between sets and hold on to something for balance if you have to). Remember: sit back as far as you can and keep your shin vertical! Three times a week: perform the one-legged deadlift. Start with 3 sets of 8 reps and add repetitions once you feel proficient and strong enough to perform the amount of work with very good technique. Twice per day, perform one-legged eccentric squats to just above parallel on the slanted board (use both legs to stand up), do 2 sets of 5 to 8 reps. Don’t add more than one rep per week and rest as much as you need to maintain perfect form. Once you have followed the 5 phase program you will have stronger muscles, healthier joints and better movement patterns. By then it will be time to move on. You will have to prepare yourself for the rigors of the athletic world. Depending on your sport you could add force absorption work, full range of motion single-leg squats or other demanding exercises that will strengthen your joints, muscles and tendons even further. That is a topic for another day. I’ve tried to put as much knowledge as possible into this article and it gives you everything you need to know to start fixing your tendonitis knee pain. There still is a lot more that can be said about the topic of knee health. 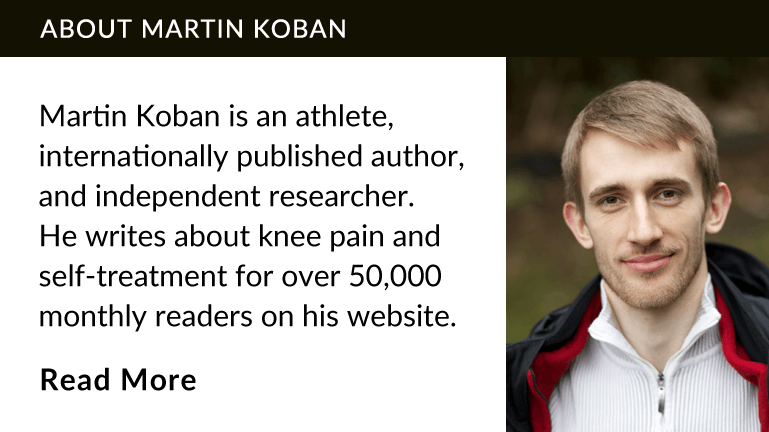 I also highly recommend you check out my book Beating Patellar Tendonitis. It’s a very comprehensive resource about all the possible mistakes you are probably making right now and that are preventing you from getting rid of patellar tendonitis. Alfredson, H.; Pietila, T.; Jonsson, P.; Lorentzon, R. (1998): Heavy-load eccentric calf muscle training for the treatment of chronic Achilles tendinosis. In Am J Sports Med 26 (3), pp. 360–366. BMJ Publishing Group Ltd and British Association of Sport and Exercise Medicine (1998): Patellar tendinopathy: some aspects of basic science and clinical management. — Khan et al. 32 (4): 346 — British Journal of Sports Medicine. With assistance of K. M. Khan, N. Maffulli, B. D. Coleman, J. L. Cook, J. E. Taunton. Available online at http://bjsm.bmj.com/content/32/4/346.citation, updated on 1/12/1998, checked on 6/03/2012. Perry Nickelston, D. FMS SFMAC: Lower Crossed Syndrome and Knee Pain. Available online at http://www.dynamicchiropractic.com/mpacms/dc/article.php?id=52178, checked on 6/03/2012. Chek, Paul (2004): How to eat, move and be healthy! Your personalized 4-step guide to looking and feeling great from the inside out. San Diego, CA: C.H.E.K. Institute. Christian Thibaudeau (2006): 7 Secrets to Rapid Recovery | T NATION. Available online at http://www.t-nation.com/free_online_article/sports_body_training_performance/7_secrets_to_rapid_recovery, updated on 27/01/2006, checked on 6/03/2012. DiNubile, Nicholas A.; Scali, Bruce (2010): Framework for the knee. A 6-step plan for preventing injury and ending pain. Emmaus, Pa: Rodale. Dr. Kelly Starrett: Episode 33: FGB Push Press Prep. Patellar Tendonitis – YouTube. Available online at https://www.youtube.com/watch?v=ydoRfEXvmU8&feature=player_embedded, checked on 6/03/2012. Frohm, Anna; Saartok, Tonu; Halvorsen, Kjartan; Renstrom, Per (2007): Eccentric treatment for patellar tendinopathy: a prospective randomised short-term pilot study of two rehabilitation protocols. In Br J Sports Med 41 (7), pp. e7. Lian, OysteinB; Engebretsen, Lars; Bahr, Roald (2005): Prevalence of jumper’s knee among elite athletes from different sports: a cross-sectional study. In Am J Sports Med 33 (4), pp. 561–567. Peter Blanchonette (2006): Eccentric Exercise – A Solution to Tendonitis? | T NATION. Available online at http://www.t-nation.com/free_online_article/sports_body_training_performance/eccentric_exercise_a_solution_to_tendonitis, updated on 3/09/2006, checked on 6/03/2012. Stanish, W. D.; Rubinovich, R. M.; Curwin, S. (1986): Eccentric exercise in chronic tendinitis. In Clin Orthop Relat Res (208), pp. 65–68. Steve Maxwell: How to Become a Pistolero | Steve Maxwell Strength & Conditioning. Available online at http://maxwellsc.com/blog.cfm?blogID=60, checked on 6/03/2012. The Sports Physical Therapy Section of the American Physical Therapy Association (2010): EVIDENCE–SUPPORTED REHABILITATION OF PATELLAR TENDINOPATHY. With assistance of Marsha Rutland, Dennis O’Connell, Jean-Michel Brismée, Phil Sizer, Gail Apte, Janelle O’Connell. Available online at http://www.ncbi.nlm.nih.gov/pmc/articles/PMC2971642/?tool=pubmed, updated on 1/01/2010, checked on 6/03/2012. Visnes, Havard; Bahr, Roald (2007): The evolution of eccentric training as treatment for patellar tendinopathy (jumper’s knee): a critical review of exercise programmes. In Br J Sports Med 41 (4), pp. 217–223. Witvrouw, E.; Bellemans, J.; Lysens, R.; Danneels, L.; Cambier, D. (2001): Intrinsic risk factors for the development of patellar tendinitis in an athletic population. A two-year prospective study. In Am J Sports Med 29 (2), pp. 190–195. Wolf, Robb (2010): The paleo solution. The original human diet. Las Vegas: Victory Belt. This page was originally published by Martin Koban on the 6th of March 2012.